An ABC News/Washington Post poll finds Donald Trump crushes Hillary Clinton among white men without college degrees 76 percent to 17 percent—a 59-point lead. For comparison, failed Republican presidential candidate Mitt Romney won this voter bloc by 31 points in 2012. Trump shot from 64 percent support to 76 percent in September alone, while Clinton sank from 24 percent to only 17 percent. Among college-educated white women, Clinton leads Trump 57 percent to 32 percent, an increase from earlier in September, when she led Trump by 10 points at 50 percent. Further, Clinton now leads by 19 points among women, Trump by 19 among men—a yawning 38-point gender gap, triple the average gender gap in exit polls dating to 1976. Nearly half, or 47 percent, of working class whites feel the country’s best days are behind us. Only 18 percent feel satisfied with the country’s economic situation, with 78 percent dissatisfied—and 53 percent very dissatisfied. Only 24 percent feel satisfied with “the influence people like you have on the political process,” with 45 percent feeling very dissatisfied. Half of working class whites believe that when their children reach their age, their standard of living will be worse than theirs is now. Sixty-two percent of working class whites believe that over the past few years, it’s gotten harder for people like them to “get ahead financially,” while 67 percent feel it’s gotten harder to find good jobs. Of registered voters, 60 percent of working class whites said they would consider voting for Trump, but only 29 percent said the same for Clinton. 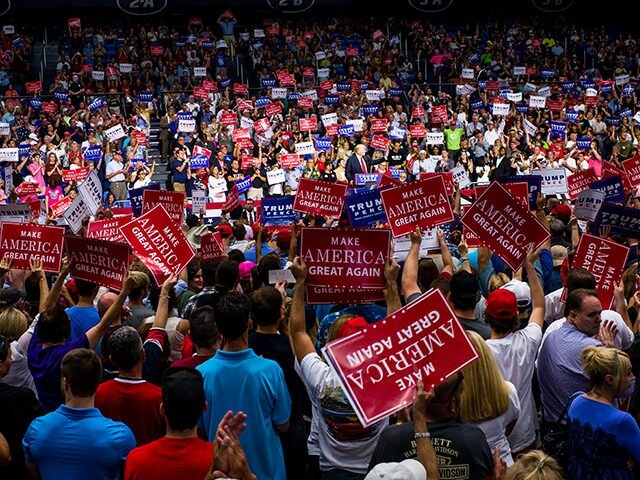 Trump’s populist, nationalist platform with “America First” positions, particularly on on immigration, trade, and war, has upended the political establishment and drawn working class voters. The poll surveyed 1,001 adults (including 651 likely voters)], with a margin of error of plus or minus 3.5 percent for the full sample, and 4.5 percent for the likely voters polled from Sept. 19 to Sept 22.